The denture process takes about one month and three to five appointments: the initial diagnosis is made; an impression and a wax bite are made to determine proper jaw position; then the prosthesis is "tryed-in" is to insure proper color, shape and fit; and the patient`s final denture is placed, following any minor adjustments. At the lab, the patient approved mold of the denture is then heated and made into plastic. The new denture is then polished and ready for wear. Pronouncing certain words may require practice. Reading out loud and repeating troublesome words will help. If your dentures "click" while you`re talking, speak more slowly. 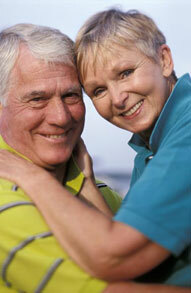 You may find that your dentures occasionally slip when you laugh, cough or smile. Reposition the dentures by gently biting down and swallowing. If a speaking problem persists, consult our office. Denture adhesives can provide additional retention for well-fitting dentures. Denture adhesives are not the solution for old, ill-fitting dentures. A poorly fitting denture, which causes constant irritation over a long period, may contribute to the development of sores. These dentures may need a reline or need to be replaced. If your dentures begin to feel loose, or cause pronounced discomfort, consult with our office immediately at (203) 272-9694.